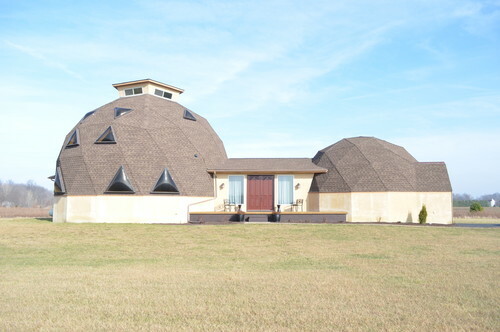 No doubt you’ve seen geodesic domes before. Some as public structures, some as private homes, but it’s safe to say that they make a statement regardless of their function. Geodesic domes stand out in a crowd because of their unique shape and their futuristic quality. “Futuristic” is perhaps the exact right way to classify a geodesic dome. One of Fuller’s intentions when creating it was to address a housing crisis that he foresaw. Building a geodesic dome is less expensive than traditional building because it uses far less material. It’s also more structurally sound than any other style of home. Geodesic domes are built out of individual triangles, able to withstand Mother Nature’s assaults while simultaneously using all that nature has to offer to heat and cool the dome. This is all without the loss of energy and at a significantly lower energy cost than traditional homes. 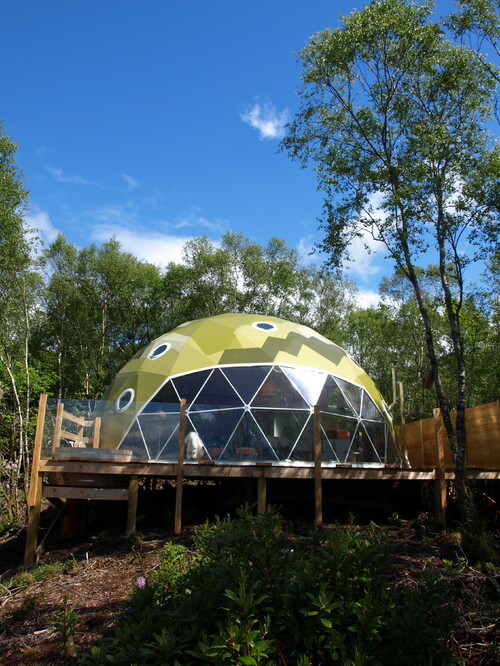 If you’re considering a geodesic dome of your own, dome builders can help. You may also consider building one of your own, in which case, there are several companies crafting dome building kits you’ll want to check out. 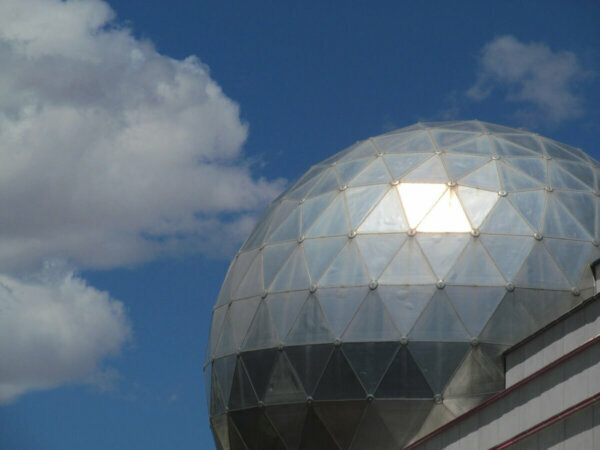 To get a better idea of the different ways geodesic domes are being used, let’s explore some public, business, and private structures. Imagine growing veggies year-round in this 30-foot geodesic greenhouse dome. Tomatoes in January, anyone? 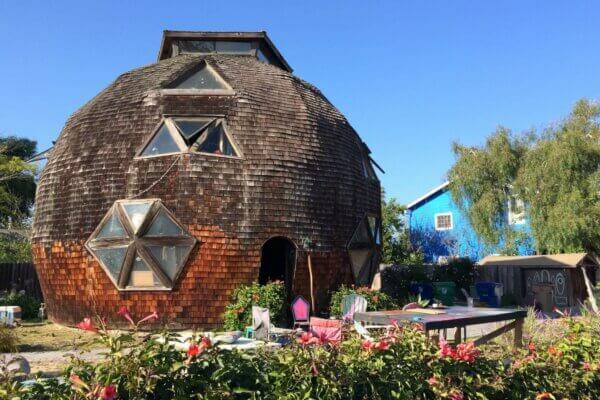 Built in the ’70s by a graduate student at University of California, Santa Barbara, this geodesic dome has a place in architecture history! Built after Buckminster Fuller’s original prototype, The Gold Dome in Shreveport, LA is used as a 3,000-seat multi-purpose arena. Located in Reno, NV, the National Bowling Stadium was built to resemble a bowling ball. The structure cost over $47 million dollars to complete and is referred to as the “Taj Mahal of tenpins”. The Climatron Greenhouse at the Missouri Botanical Garden, made of a geodesic dome, simulates the climate of a rain forest and is used for conservational and educational purposes. 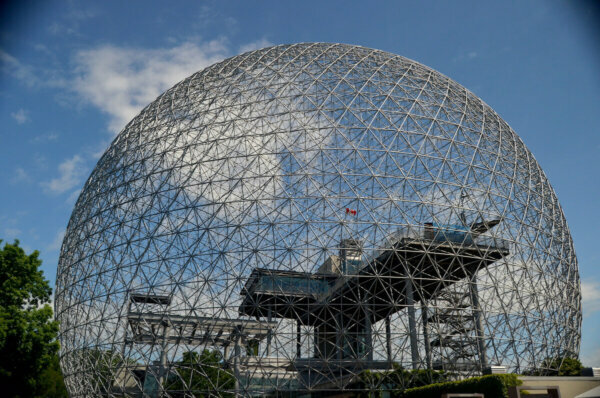 Designed by Buckminster Fuller himself, the Biosphere is a museum in Montreal dedicated to the environment. 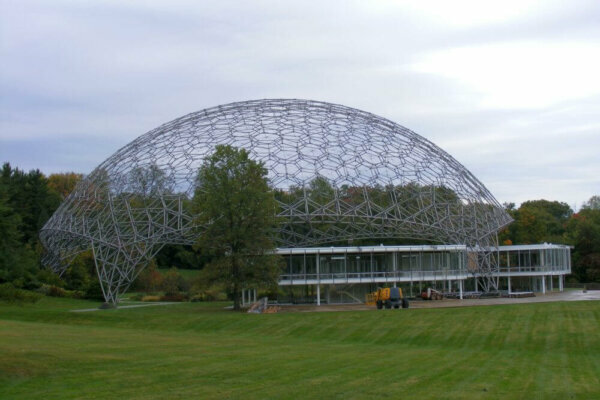 Located in Geauga County, Ohio, this geodesic dome is the headquarters for ASM International, a professional organization for materials scientists and engineers. The structure was built in 1958. This geodesic dome encapsulates a desert climate at the Omaha Zoo, while housing nocturnal animals underneath. 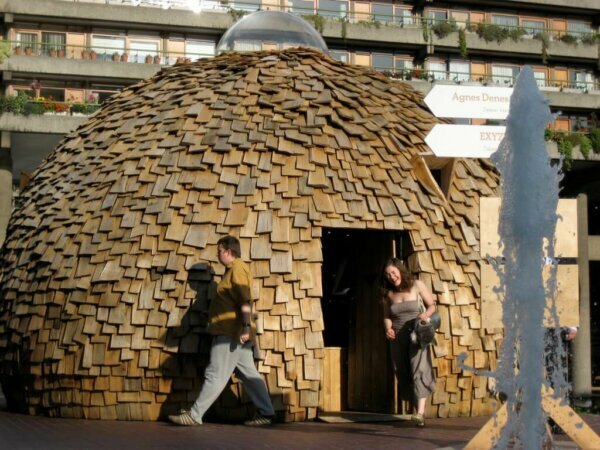 Located in London, the Barbican Art Gallery claims twin geodesic domes built as a pavilion by the waterside as part of their Radical Nature summer show. If you’re not already a camper, you may rethink your stance if you could stay in a dome like this. 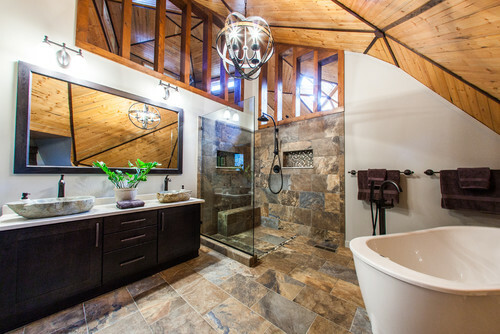 Just as cozy and inviting as a traditional home but with all the benefits of a geodesic structure. 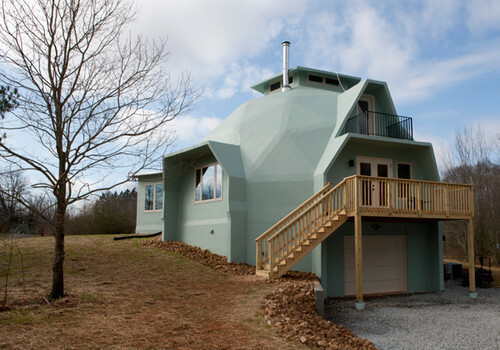 Who says a geodesic dome home can’t be luxurious? No doubt this home gets noticed! 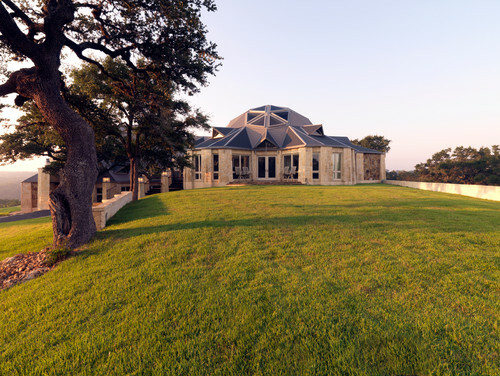 This home perfectly blends the traditional exterior of modern homes with the architecture of a geodesic dome. The interior of a geodesic home offers unique design opportunities. Notice how this home captures the natural light pouring in through the windows. 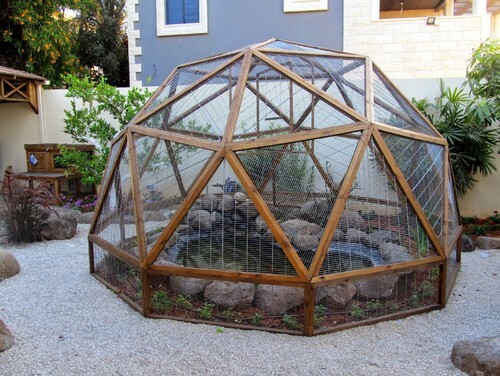 Create your own ecosystem with a wooden geodesic dome like this. Wooden domes are also popular builds for children to play in. Imagine a skylight of this size! This structure was built over a sunken garden. Maximize the eco-friendly opportunities living by the ocean provides with a geodesic home in a tropical paradise. The stability of a geodesic dome make them an ideal option for an event tent. The interior of this space can easily be transformed to look magical. 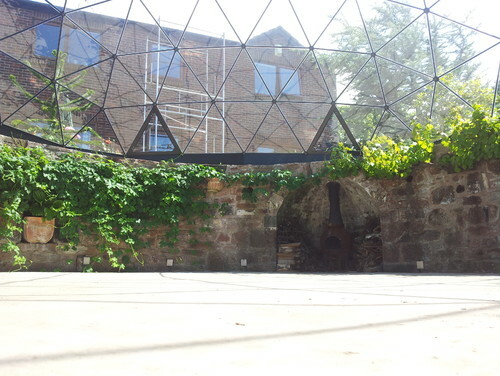 The design elements of a geodesic dome create a tranquil space to be used for meditative purposes. This is a new and unique way to enjoy the Alps. May not be ideal for the faint of heart. 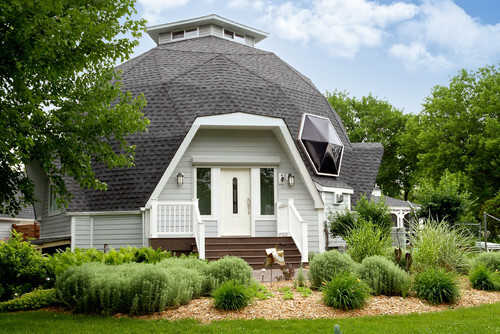 Located in Ohio, this home blends a Craftsman style into this family’s geodesic dome.